Imo State was created on February 3, 1976 out of the old East Central State by the then regime of General Murtala Mohammed. Abia State was carved out of Imo State in the state creation exercise of 1991. It has Owerri as it capital and largest city. Other major towns are Okigwe, Oguta, Nkwerre, Orlu, Mbaise, Mbano, Mbieri, Ideato, Awo-Idemili, Ohaji, Obowo, Ngor-Okpuala, Uzoagba, Emekuku, Orodo, Mgbidi. Situated in south eastern Nigeria, Imo State covers an area of 5,530 square kilometres. Imo State shares boundaries with Enugu and Ebonyi States to the north, Anambra State to the west, Rivers State to the south and in the North and Rivers State to the South, Cross River and Akwa Ibom States to the east. The inhabitants of Imo State are Igbo. The official language of the state is Igbo alongside English. Imo State has a rich cultural heritage. This is manifested in dressing, music, dance, festivals, arts and crafts. Imo State derives its name from Imo River, which takes its course from the Okigwe/Awka upland. It lies within latitudes 4°45'N and 7°15'N, and longitude 6°50'E and 7°25'E. Imo State has many rivers. The main rivers in the state are Imo, Otamiri and Njaba. The major lakes are in Oguta and Abadaba in Obowu local government area. The main streams draining the state are Imo, Otamiri, Njaba and Orasi rivers, all of which have very few tributaries. With the exception of Imo River, which runs through the area underlain by the Imo Shales, other rivers rise within the coastal plain sands. Generally, river valleys constitute the major physical features, which are often marshy. The vegetation is tropical rain forest. Imo State indigenes are predominantly Christians of different denominations, but mostly Catholicism. Some people in the state still practice traditional religions. The State is blessed with abundant natural resources. These include crude oil, lead, zinc, white clay, fine sand, limestone and natural gas in commercial quantities. The state also produces agricultural produce such as palm produce, cocoa and rubber. The main staple crops are yam, cassava, cocoyam and maize. Learned professionals, entrepreneurs and seasoned artists also abound in the state. Works of art produced in the state include: carved doors, walking sticks of different designs, sculptures, flutes, wooden mortars and pestles, gongs, and the famous talking drums. Metal works and various types of fabrications are locally produced. Some art & cultural centers include: The Mbari Cultural Center at Owerri, Eke Nguru in Aboh Mbaise and lgwekala shrine in Umunoha are traditional art and craft centers that depict the culture and heritage of the lgbo. Industries include Fuason Industries, Owerri, which produces galvanized iron sheets, the Afrik Enterprises, Awo-Omama, a pharmaceutical company, Imo Concord Hotel, Owerri. Industries that had been partially privatized include card packaged Industry, Orlu, Resin Paints Limited, Aboh Mbaise and Aluminium Extrusion Industry, Inyisi. Industries in the private sector include Sab Spare Parts and Allied Accessories, Okigwe, which make motor-spare parts, Oma Pharmaceutical, Awomoma, which produces drugs and medicines, Magil Industries Atta, which makes steel, sponge, bread, polythene and paper. Economic trees like the iroko, mahogany, obeche, gmelina, bamboo, rubber palm and oil palm are in abundance. Historical Development: Imo State is one of the seven states created by the Federal Military Government on February 3,1976 during the MohammedObasanjo regime. Hitherto, the area known as tmo State was part of the defunct East Central State which was one of the twelve states initially created by the Federal Military Government (General Yakubu Gowon's regime) in 1967. With the creation of more states in 1991 by General lbrahim Babangida, Abia State was carved out from Imo State. 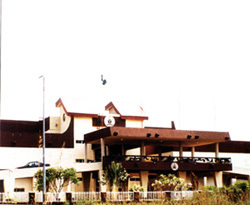 The new Imo State is divided into twentyseven local governments areas (LGAs), and three senatorial zones . Administrative Structure: Like other states of the federation, the administrative structure of the state is threetiered state, local and autonomous community levels. At the state level, it is composed of three arms the Executive, the Legislative and the Judiciary. The executive arm is headed by an elected Governor who is assisted by a deputy gov ernor, commissioners and executive advisers. The legislative arm, headed by the Speaker of the State House of Assembly, is made up of elected legisla tors; it is the lawmaking body of the state. The judiciary is charged with the responsibility of the administration of justice and is headed by the Chief Judge of the state. Functions of the government are carried out through the various ministries and parastatals. The ministries are: Justice, Agriculture and Natural Resources, Education, Health, Commerce, Industry and Tourism, Finance, Works and Transport. There are four new directorates for Information and Culture; Land, Survey and Urban Planning; Social Development, Youth and Sports and Rural Development. The Office of the Secretary to the State Government is the official secretariat of the state government and is headed by the Secretary to the State Government. It coordinates the activities of the various ministries, directorates and extra ministerial departments. Each local government is headed by a chair man, assisted by a deputy chairman and supervi sory councillors, who make up the executive arm. The Local Government legislative arm is composed of ten to twelve elected ward counsellors from each local government area, headed by a Speaker of the LGA, while the Judiciary is represented by one customary court in each LGA, headed by a Chairman. At the community level, the autonomous communities are headed by traditional rulers called Ezes, who in turn have their own cabinet of appointed chiefs and titled men. Ethnic Composition and Culture: The inhab itants of Imo State are lgbos, a culturally homoge neous group. The lgbo language is spoken throughout the state with minor differences in dialects. The official language of the state is how ever, English. Imo State has a very rich cultural her itage. This is manifested in dressing, music, dance, festivals, arts and crafts, and the traditional hospitality of the people. Most of these festivals take place within the last quarter of every year. Iwa Akwa festival – celebrated every three years by all the communities. Nta Cultural festival – last week of August – New cropping season. Ewu –Ukwu- (unanimously celebrated by all the communities) women that has up to 10 children in her husband’s place. Iriji festival ( New Yam festival) August 15th unanimously celebrated by all the communities. Wrestling Cultural festival– Dec. after farming season. Iriji festival – (new yam festival) unanimously celebrated by the 24 autonomous communities. New Yam festival – between August and early September yearly. NOTE: the festivals are between October and January every year. Owu festival – performed around April and July. New Yam festival – performed between August and October. Omereife festival (new yam ) – performed between July, August – September by, Mgbele, Nkwesi, Nneukwu, Osu Obodo Eziorsu, Oguta Egbuoma and Egwe communities. Ihe Udummiri festival (to thank God for rains) – performed between June/July by Umuapu, Mgbirichi and Umuokanne communities. New yam festival – performed during August. Ekeleke Dancing Group – performed by Umuomezume kindred Ofekata Orodo on every Eke day starting from April to first week of June. Okorosha festival – performed by Ifakala, Mbieri and Ubomiri communities in the months of December and January. Owu festival – performed by Orodo, Ifakala and Afara Communities respectively within the months of July and August. Iri ji, Itu Aka, Ajala, Ikummanu, Okpakala, Iwufu ji and Ikeji – to seek God’s blessings or thank him for his providence, protection and sustenance of life during planting and harvesting period celebratd in most communities of the Council. harvest season, the most popular being the Ahiajoku Festival, which is observed in all the farm ing communities. Music and Dancing: Imo State is rich in tradi tional music and dances, which have persisted in spite of foreign influences. The lgbos have different types of music to suit various occasions, such as work, leisure, marriage, and funeral. Dress: The traditional apparel for the men is an overflowing jumper or a longsleeved shirt worn over the George wrapper, which is tied round the waist, flowing down to the ankles. This dress is complemented with a cap and a walking stick, which serves as an instrument of support and defence. The traditional wear for the women is a blouse, worn over a loin cloth. This female outfit goes with a headtie, ear rings and necklaces. Arts and Crafts: Traditional artists abound in the state. Works of art produced in the state include: carved doors, walking sticks of different designs, sculptures, flutes, wooden mortars and pestles, gongs, and the famous talking drums. Metal works and various types of fabrications are locally produced. Culture: Part of the culture of the state is the lgbo traditional hospitality to visitors, which begins with the presentation of kolanuts to the visitor. The kolanut signifies that the visitor is heartily wel comed. The ritual of the presentation of the kolanut is consummated with the offering of prayers and thanksgiving or petition to the supreme God and other deities, for the protection of the visitor and the host. Religion: There is freedom of worship in Imo State and religion occupies a central place in the lives of the people. The people are predominantly Christians of different denominations. There are also a good number of Moslems in the state. They live together in harmony with their Christian neigh bours. Some people in the state still cling to the local traditional religion. Location: Imo State derives its name from Imo River, which takes its course from the Okigwe/Awka upland. It lies within latitudes 4°45'N and 7°15'N, and longitude 6°50'E and 7°25'E. It occupies the area between the lower River Niger and the upper and middle Imo River. Imo State is bounded on the east by Abia State, on the west by the River Niger and Delta State; and on the north byAnambra State, while Rivers State lies to the south. Imo State cov ers an area of about 5,100sq km. Tertiary age, is rather deep, porous, infertile and highly leached. In some areas like Okigwe, impermeable layers of clay occur near the surface, while in other areas, the soil consists of lateritic material under a superficial layer of finegrained sand. Rivers are few with vast inter fluves which are characterised by dry valleys that carry surface drainage in periods of high rainfall. The phenomenal monotony of the terrain may be accounted for by the absence of any tectonic disturbances and by the homogeneity of the rock structure (Udo, 1970). The main streams draining the state are Imo, Otamiri, Njaba and Ulasi rivers, all of which have very few tributaries. With the exception of Imo River, which runs through the area underlain by the Imo Shales, other rivers rise within the coastal plain sands. Generally, river valleys constitute the major physical features, which are often marshy. The undulating nature of the interfluves gives rise to numerous depressions especially in the northeast Rainfall distribution is bimodal, with peaks in July and September and a twoweek break in August. The rainy season begins in March and lasts till October or early November. From March to May, there are violent storms which destroy crops and houses. Rainfall is often at its maximum at night and during the early morning hours. However, vari ations occur in rainfall amount from year to year. Annual rainfall varies from 1,990 mm to 2,200. Temperatures are similar all over the state. The hottest months are January to March, with the mean annual temperature above 20°C. The influ ence of the harmattan lasts for about nine weeks (i.e. from late December to late February). Imo State has an average annual relative humidity of 75 per cent which is highest during the rainy season, when it rises to about 90 per cent. The high tem perature and humidity experienced in the state favour luxuriant plant growth, which ideally should produce the climax vegetation of the tropical rain forest. Economic trees like the iroko, mahogany, obeche, gmelina, bamboo, rubber and oil palm pre dominate. But due to high population density, most of the state has been so farmed and degraded that the original vegetation has disappeared. Thus farm ers are forced into marginal lands, a situation aggravated by the rising demand for fuelwood. Deforestation has triggered off acute soil erosion especially in the Okigwe Orlu axis. Tags: February 1976 Imo Owerri Okigwe Oguta Nkwerre Orlu Mbaise Mbano Mbieri Ideato Awo-Idemili Ohaji Obowo Ngor-Okpuala Uzoagba Emekuku Orodo Mgbidi.